To date, Jay Bruce hasn’t lived up to the hype that comes with being the No. 1 prospect in baseball. He’s made progress for sure, and it shows in his 2009 numbers. His OBP sits at .345, far above his .318 career average. This shows up in his wOBA, which is 20 points higher than last year, and he’s only 103 PA behind the 387 he accumulated last year. There’s still time for Bruce to turn this into a breakout season, and given improvement in one aspect of his game, we just might see it. When Baseball America named Bruce the No. 1 overall prospect in 2008, they said that he “has few faults.” Given his 2007 performance, it’s easy to understand why they’d say that. He clobbered the Florida State League before a brief stint of dominance in the AA Southern League. The Reds moved him to AAA to cover for an injury, but he hit so well that they kept him there. In 204 PA, he racked up 57 hits, including 25 for extra bases. Baseball America said it, though they didn’t really need to: Bruce was ready for the bigs in 2008, at age 21. Bruce had held his own during his two previous minor league seasons, 2005 playing in the rookie league and 2006 in the class-A Midwest League. One factor that held him back was his performance against lefties. During his debut in 2005 he displayed a distinct split, a .874 OPS against righties and a .719 mark against lefties. In the Midwest League he displayed a similar split, .932 against righties and .790 against lefties. The biggest difference was that he faced lefties in only 21 percent of his PA that year. We know that splits, especially of the platoon variety, can display plenty of noise to go with the signal, especially in small samples. This effect can be amplified for young players who are still getting used to the rigors of a full baseball season. Bruce showed in 2007 that maybe hitting lefties wouldn’t be a problem. He faced a lefty 30 percent of the time that year and posted a .919 OPS, against a .992 vs. righties. That was, of course, a pretty small sample itself, just 177 PA, but it also showed that his splits from 05 and 06 weren’t necessarily indicative of his skill. Yet, when he showed up in the majors, he certainly displayed that platoon split. Pick a number and it was probably poor against lefties: a .190 BA, a .263 OBP, a .109 ISO, a .255 wOBA, -9.2 wRAA. He also struck out in 33.6 percent of his at-bats against them. 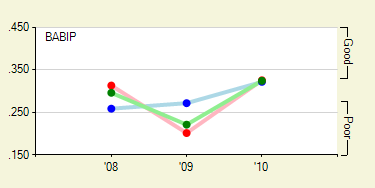 In 2009 he improved in some aspects, but he was still a far below average hitter against lefties, a mere 73 wRC+. He had lowered his overall strikeout rate against lefties but still whiffed against them far more than against righties. He still didn’t hit them for power, a .120 ISO. The only positive was that he started walking against them and had a .313 OBP, while he had a .299 mark against righties. 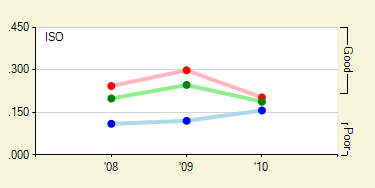 While, as Jack noted in Bruce’s The Year Ahead section, his low BABIP was a concern coming into 2010, his platoon splits also had to be something of a concern. It’s certainly something that a young player can correct — the record books are full of lefties who struggled against same-handed pitchers only to turn things around as they matured. This year Bruce has started showing signs of such a turnaround. The most notable improvement comes in his power, a .157 ISO on the strength of three homers and four doubles in 83 AB. But he’s made progress in other areas, as well. Check out the following platoon split graphs. 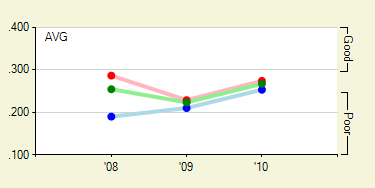 These are just his AVG, BABIP, and ISO, but you can see see his whole platoon graph page and see a similar effect. Many of the graphs start with the blue (lefty) and red (righty) dots decently far apart. In every case they’re much closer together this year. We are, of course, dealing with volatile samples, both for this season and for Bruce’s career. It would not be surprising, however, to see a 23-year-old start to improve certain aspects of his game, including his performance against same-handed pitchers. If what we’re seeing is a true improvement and not an ephemeral trend disguised as a small sample, we could see a turnaround from Bruce as soon as this year. His BABIP is up to .324. His line drive rate is up to 21.7 percent. He’s slumped a bit in June, hitting .227 and walking just seven times, but even then he has seven homers, two doubles, and a triple, giving him a .228 ISO, an improvement on his first two months. Things could be coming together for Jay Bruce. If he puts it all together this year and breaks out in the second half, it could be just what the Reds need to keep up their pace in the NL Central. We hoped you liked reading Jay Bruce Showing Improvement Against Lefties by Joe Pawlikowski! I don’t care how good Jay Bruce is, the Reds will never win the AL Central. Good article though, wasn’t aware of this yet. I’ll take the Reds’ odds over the Cardinals’ especially after Carpenter gets hurt again. Even without Carpenter, the Cardinals are a much better team than the Reds on paper. The Reds have a shot, but they need to make a move to overtake the Cards on talent. Nah the Minnesota Twins handle their farm too well.